Rocket Copters are light-up flying toys which are shot into the air and descend slowly to the ground. The batteries for the LED lights can't be replaced once they are depleted, but the toy should still bring enough enjoyment to make it worth buying. Rocket Copters are light-up helicopter toys which shoot into the air like a rocket and fall gently to the ground like a copter. Read our Rocket Copters review here. You can get Rocket Copters from the official website for $14.99 + $4.99 S&H. This is a 9-piece set which includes 6 copters and three launchers. This product is sold in stores – typically in the toy section or the As Seen on TV section – for about $10. The in-store version offers 6 copters and 3 launchers. Rocket Copters are simple toys which can be shot up into the air like a rocket and gently fall back to the ground like a copter (thus the name “Rocket Copters”). They feature LED lights which make the toy ideal for nighttime use. Rocket Copters were first advertised in late 2015 in a small marketing campaign, and became available in stores in 2016. It continues to advertise on television in mid-2016. There are two components to Rocket Copters: the launcher and the copter itself. The copter consists of a piece of plastic with a hook, an on-off switch, and wings. The launcher is a hard piece of plastic with a rubber band, resembling a simple slingshot. To use Rocket Copters, you simply hook the notch of the copter to the rubber band on the launcher, point skyward, pull back, and release. If everything goes according to plan, the copter will fly upward and gently fall back to earth. At night, with the LED engaged, it provides a beautiful and exciting display. Note, we’ve seen similar items for sale by street vendors for years in tourist areas. This As Seen on TV version is basically the same design as those. You’ll want to be sure to aim the toy as straight up as possible, unless you don’t mind it traveling up to a couple hundred feet away should you launch it while it is tilted. You’ll also want to use it in an area free of trees or power lines. Ideally, it will be used where it won’t land on pavement, as we’ve found that can damage the toy. A soft dirt or grass landing area is ideal. The product’s LED light is both a highlight and a weak point. When it works, it provides nighttime entertainment, and a beautiful display as the copter travels up and down. It also makes the copter easy to find after it lands. Unfortunately, the battery for the light is not rechargeable or replaceable, so once it runs out of power, the light will no longer work. You can still use it in the daytime, however. There is one minor design “flaw” which will result in some kids clipping their hands with the rubber band when launching the copters. How a person holds and releases it seems to dictate whether or not they will get clipped. Some consumers have even reported having their skin punctured when this happens. This is not a long-term toy, nor is it particularly durable or made of high quality materials. Given its price to fun ratio, however, most consumers seem to understand that they aren’t meant to last. 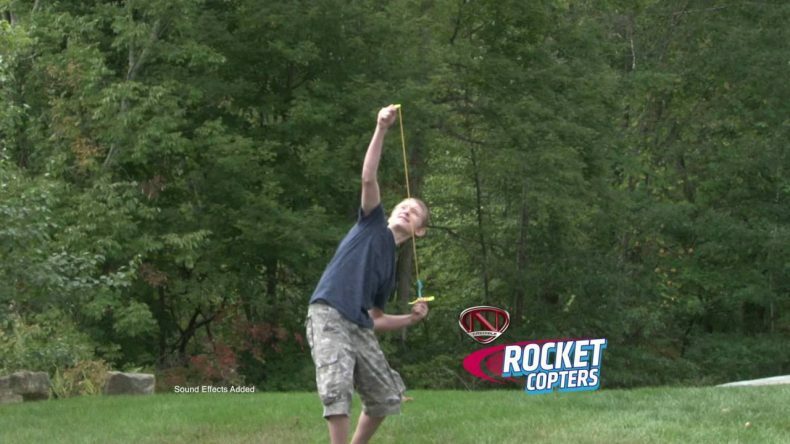 Overall, Rocket Copters provide hours of fun, and would make a great way for kids to get in on a celebration such as July 4th. Our product researchers give this about a 4-star rating, which closely aligns with the Amazon rating as of June 2016, which is just under 4 stars. Rocket Copters are not unique, as these toys have been sold by street vendors for years. Online, you can also find a number of similar products, such as this 12-piece set (labeled 48 for some reason) for about $10. There are also more durable (and more re-usable) options available, including the Night Copter, which runs about $12. Here is a video which features Rocket Copters, and another LED flying toy, Whirly Ball. Rocket Copters are light-up flying toys which are shot into the air and descend slowly to the ground. The batteries for the LED lights can’t be replaced once they are depleted, but the toy should still bring enough enjoyment to make it worth buying. We suggest picking these up at a local store to avoid shipping delays and costs. Have you tried Rocket Copters? Please give it a star rating and comment below. Had a blast, not to expensive, and everyone got to launch together. Great distance and durable. Thank you.... AS SEEN ON TV....truly.......NCREDIBLE. No complaints, and just an idea.....longer blades.......bigger rockets....tripod shooter? Loved it, great nite light flight.